PRODUCT DESCRIPTION: Pecan Surprise is a special nut based paste which squirrels, rats, mice, chipmunks, flying squirrels and other small animals love. It combines nuts and other sweet, nutritious attractants into a "sticky" paste which cannot be ignored by nuisance animals. WHERE TO USE IT: In and around businesses, homes and commercial establishments where you need to bait or use traps. 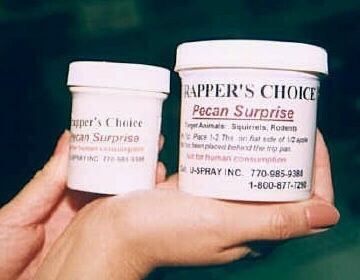 Pecan Surprise is a great way to get targeted animals to accept rodenticide or enter a cage thus insuring a quick catch. RATE OF APPLICATION: Small dabs of 1/2 to 1 teaspoonful is all that's needed for live or kill set traps. Use "rice sized" dabs at trap entrances to insure they the way inside. It's strong nutty scent will permeate all around the placement and is sure to get the attention of any animal foraging close to your set. I had a squirrel issue and nothing seemed to work in the trap (nuts, sunflower seeds, peanut butter, etc…). But the Pecan delight did the job – it really works! Ordering was easy and shipping fast. Haven't caught any pest with it yet. Company is fine. THE BEST! I HAVE BEEN TRYING TO TRAP CHIPMUNKS AROUND MY HOUSE FOR A COUPLE OF MONTHS WITH NO SUCCESS. SINCE I PURCHASED THE PECAN PAST I HAVE CAUGHT 1 OR 2 CHIPMUNKS EVERY DAY FOR THE LAST 2 WEEKS. 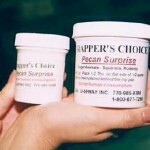 BEST CHIPMUNK BAIT YOU CAN BUY! Best thing ever. We have caught 9 chipmunks in 3 days. We have set them free to live out a beautiful new life that does not include our zen garden. It works like magic along with a few sunflower seeds!!! We also use their live trap! Chipmunk Elimination! Mixing this paste with the poison packets was very successful in eliminating chipmunks that were doing damage under my front porch stoop. Excellent bait! After 15 min of putting trap and pecan paste down had my first house mouse. Three more killed over the the next day – I'm now mouse free! This paste seems to attract them immediately!! Very fragrant. I can see why the squirrels and chipmunks can't resist. Great stuff! Have used this pecan paste for a few years to lure our pesky and abundant chipmunks (ground squirrels) into traps. It's a great product. We use maybe 1/2 teaspoon in each trap so the container lasts quite a long time. Tried other products before we found Trappers Choice and this is definitely the best! I spread the paste on the back of the havahart trap and have caught several squirrels. I will be buying more paste when I run out! Like candy! We live in the AZ desert and sometimes have an abundance of Harris Antelope Ground Squirrels. If we get too many, they start burrowing under our patios, house foundation, etc. We use 2 Havahart traps but didn't have much success with peanut butter/nuts. Thought we'd try some Pecan Paste and put it on a slice of apple as directed. We caught a squirrel in less than 30 minutes! Next day we caught 5 MORE! We couldn't get anything done because we had to keep stopping to drive/release the squirrels we caught. Kept using the same bait over and over too, because once caught, they lose interest in eating and just try to escape. Then next day, a tiny squirrel snuck inside the trap and ate almost all of the pecan paste off the apple and somehow got away! We reset it anyway and caught another one. At that point, with 7 gone, the population was back to being manageable. If the numbers ever get out of control again, we certainly know what to do! Pecan paste is like candy to our ground squirrels!! Bait works well and was received quickly. Pecan paste works the first time and all the time! Chipmunk Nirvana! Second batch ordered. Our first batch lasted over two years baiting Havahart traps for chipmunks. This bait is irresistible and very little is needed for each set, which makes the cost quite reasonable. Often a trap will trip in 20 minutes or less. I haven't used the stuff before and needed to refill. It works great for catching Chip monks. I caught my first one for this year and probably more than a dozen over the past years. I highly recommend the Pecan paste. Have trouble with ground squirrels and chipmunks. Have used Loganberry paste until this year when I bought pecan paste. Much better response to the Pecan Paste. Good product.